My children can’t get enough of these wonderful, fast computers, especially my 11-year-old, who uses the lab every day for her schoolwork. I know that as she gets older, she’ll use this lab to research colleges and send in applications. That, also, makes my husband and me very happy. Education is what it’s all about! This week, CAMBA celebrated the opening of their new computer lab in their Cypress Hills Cornerstone Community Center followed by a ribbon-cutting ceremony in East New York. Through CAMBA’s partnership with New York Housing Authority (NYCHA), New York City Department of Youth and Community Development and The Rogosin Institute, the community center received a state of the art computer lab containing twenty-eight apple computers along with a printer donated to the location by The Rogosin Institute, the non-profit institution for research, treatment and prevention of kidney disease. 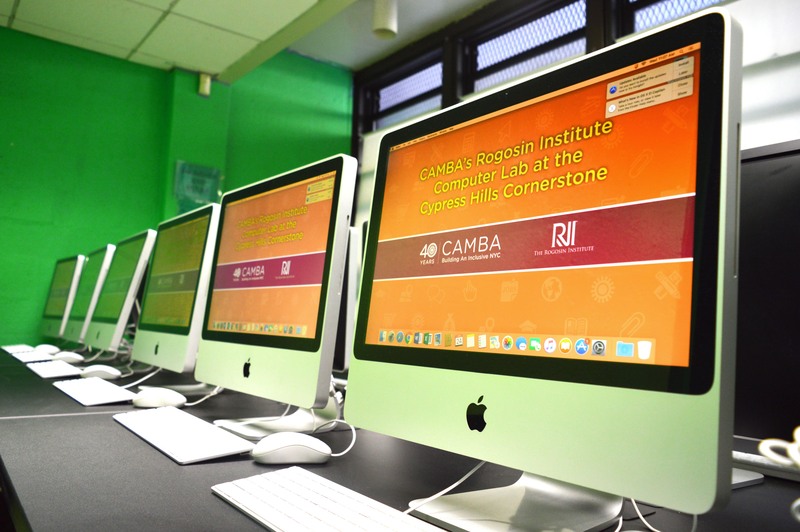 This was the third computer lab collaboration of CAMBA and the Rogosin Institute; the other two labs are located in The Kensington Family Shelter in 2016 and in the Flagstone Family Shelter. The Cypress Hills Cornerstone Community Center provides a variety of programs and services for all ages of the community, including health and wellness, meals, fitness, financial literacy and the arts. The computer lab provides children, adults and elders with better access to skill development, general learning schoolwork resumes and job searching. CAMBA is grateful to The Rogosin Institute for generously making this possible.